In this post, I have written about a simple Mantra for gaining the special ability of possessing Mastery over words or speech and becoming quick-witted, tactful and never being at a loss for words. This Mantra is called in the Hindi language as Hajirjababi, Chatur Aur Tarksheel Banne Ka Mantra. Being quick and sharp witted and always having an answer for anything is a major quality that is present in most very successful people who are in public life or are in a profession that is somewhere or the other connected to public life. This special quality can be seen in most successful politicians, lawyers, sales parsons, comedians, public speakers and debaters. Even some most popular and famous God-men, New Age Gurus and Psychics, Fortune Tellers, Palmists and Astrologers possess this special quality, these people are always quick to respond to any question and are easily able to divert and by-pass it towards some other conversation, when they do not know the actual answer. Vachan Chaturya or Word Tact is different from Vak or Vacha Siddhi, which is the supernatural ability of making the spoken word or promise come true. 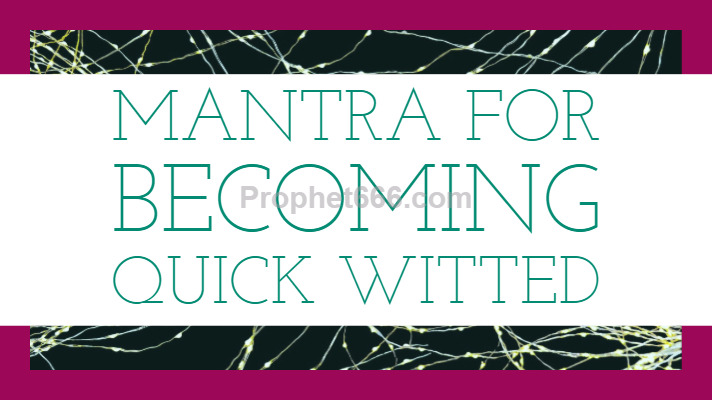 The Mantra for becoming quick witted given in this post has its origins in the Jain Religion and there is a very simple Vidhi of actually practicing this Mantra, which is to chant it for 1 Mala or 108 Mantra Chants daily. The practitioner can use any Mala, including a Rudraksha Japa Mala for this purpose. There is no special Vidhi or any rules like Shubh Disha, Aasan, Mala or Shubh Muhurat prescribed for this Mantra and only the regular chanting of the Mantra is essential for becoming quick witted. Apart from the daily 1 Mala, the practitioner should chant the Mantra 21 times before actually going to take part in any debate, discourse, question-answer session or any other task in which he has to give answers to the public or any other person. Notes- This is also a simple Mantra Chant for gaining the supernatural ability for never being at a loss for words and becoming sharp witted. If you decide to practice this Mantra Chant, please share your experiences with others readers of this site who may wish to practice it. 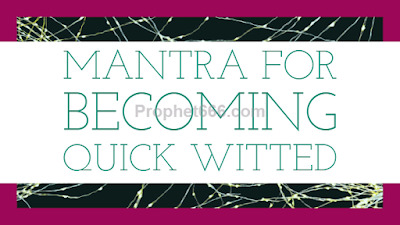 Readers can see the other sections of this site, including the sections of the Best Mind and Brain Mantras and Saraswati Mantras for many more Mantra Chants for enhancing the function of the mind and brain. In post it is specified as, chanting 1 mala daily. So, when is the siddhi attained?. Is there any specific count to do prayog.? what if the jaapa is stopped after some period of time, will the ability of "quick wittiness" go away. ?